At Stephanie's wake, her father said something that's stuck with me ever since. "She was always so adventurous," he said. I'm not sure I'd ever used that word to describe her while she was alive, but it's exactly the right word. First and most obviously, she flew out to San Francisco to meet me, a man she only knew from letters and zines. And then she spent the rest of her life with that guy. What's that, if not adventurous? If someone described the situation to me, but it was two other people, not Steph and I, my best advice would be to run the other way. Instead, she ran my way. But Stephanie was adventurous, long before she met me. Like a lot of teenaged girls, she had worked as a baby-sitter in high school, and somehow, when she was barely 18, she parlayed that experience into a summer job as a nanny. 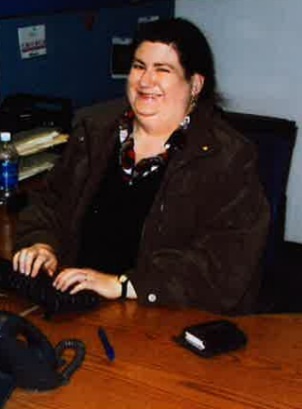 She worked and lived with a married couple and their kids in New England, several states away from anyone she knew. And you know what? She was great at being a nanny. Every time she mentioned it, she said that she'd loved the work and loved the kids, but that the most important thing she'd learned as a nanny was that she didn't want to be a mother. She went to Russia before I knew her, shortly after the collapse of the USSR, and while she was there she was not-quite-arrested but very much "detained" for questioning. Russian subway stations are marvelously ornate, more like an old-time movie palace than an American subway station, and Steph thought one of the stations in St Petersburg was particularly photo-worthy, so – click-click. A Russian soldier or cop appeared, and she was taken to an interrogation room where the authorities spent an hour peppering her with the same questions over and over again: Why are you taking pictures? Why is an American in Russia taking pictures in the subway? What is the purpose of taking pictures in the subway? Steph being Steph, she kept her cool under the pressure, and eventually they confiscated her roll of film, but let her leave with a stern warning to be mindful of where she was taking photos. When we became a couple, she already had a computer and some internet savvy – so she was ahead of the curve, for the mid-1990s. Adventurous, in other words. To be sure, I'd had no interest in computers or the net before she showed me the basics. On a philosophical level, Stephanie didn't share what seems to be most Americans' fear of the different — the gays, the Muslims, the Mexicans, the terrorists, in old days the communists, and whatever we're supposed to be fearful of this week. She thought Americans were tough enough to stand up to any real danger, and that the imagined dangers were mostly just silly. "Put a bunch of white Baptists in the same room, and it'll probably be peaceful — but boring. Bring a bunch of people together from different places, with a lot of different backgrounds and religions and characteristics, and you have America. There might be an argument, but it'll be interesting." She always wanted to do something new, every weekend. Anything that she'd never done before was given special consideration. Maybe a restaurant we'd never been to, a taste of some new cuisine she'd never tried. I wouldn't know what Korean food tasted like, or Vietnamese, or Cajun, or Japanese, or good barbeque or Chinese food, if not for Steph. Or, she often wanted to take a drive to some place we'd never been. I can't count the number of enjoyable afternoons and overnights we had, in places I never would've gone without her. I don't remember the details of how we did it, or why we did it, but in San Francisco we forged press passes naming us as reporters for Zine World, and the passes worked – we gained free access to a big software convention at Mosconi Center. We spent a couple of hours surrounded by high-tech people, and interviewed two of them, but I'm pretty sure we didn't print anything about any of this in Zine World. Even after she was in a wheelchair, Stephanie was still adventurous. She beat the heck out of that chair-on-wheels, and took it through sleet and snow and mud. We went places and did things while she was in the chair — not always the same things we'd done before the amputation, but "an adventure as often as possible" was always the rule. And she loved it when I would push her chair super-speedy. 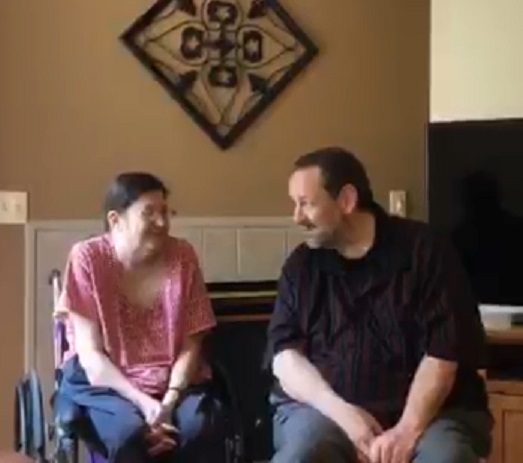 I remember an afternoon at the Milwaukee Zoo, when I ran down a slight hill as fast as I could, pushing her wheelchair, while she hollered happily and held her hands in the air like a kid on a rollercoaster. I'm pretty sure she was wearing her Wonder Woman t-shirt that day. When she was a kid, Stephanie's family went camping just about every summer. My family did, too. She went fishing on those family camping trips, and her mom or dad would clean and cook the fish she caught. I went fishing as a kid, but never caught anything. Steph told me that she'd brought books on her family's camping trips, and I did, too, though she was probably reading better books than mine. She was sometimes gently scolded by her parents for reading, and so was I. "We're in the forest (or at the mountain, or next to the lake, whatever) so what are you reading for? Put down the book and go hike or swim, or play with your brother." Camping and reading, it seemed, were two things you could do, but not at the same time. Neither of us had ever been camping or fishing as adults, but when we compared our childhood memories, we decided that we wanted to go camping, and Stephanie wanted to go fishing. So circa 2006 or 2007, we started buying equipment – sleeping bags, a tiny tent, a fishing pole for Stephanie, and eventually some camping cookware and a larger tent. Fishing and camping became our new hobbies, though we never went fishing when we were camping. Fishing was an afternoon at Tenney Park, inside Madison's city limits; camping was a long drive to a state park, and an overnight stay among the mosquitoes and chiggers. When she went fishing I tagged along, just reading a book in the sunshine or shade. Fishing held no fascination for me, but an afternoon in the park with Steph was always delightful. She was a good fisherlady; only once did she fail to catch a fish, and most times she caught several. Only once, though, did she catch the stereotypical fish from a day gone fishing — something with serious meat on its bones. The other fish she caught were all what I'd call aquarium fish — hand-sized and flat, with more fins than meat. All the fish Steph caught were released back into the lake, even that one fish that looked like a good dinner. Food wasn't really the point of our fishing days. To some extent, she didn't want the mess and the stink of gutting a fish. Or, as she explained a few times before gently plopping a fish back into the water, she wanted to give the fish another chance. Or she discreetly pointed at a woman fishing across the water, or at some middle-aged guy in the distance with two scruffy-looking kids and three poles, and she said, "We have plenty to eat in our kitchen, but those people look like they're fishing for food. They need it more than we do." When we went camping, it was usually a blast. We'd pitch our tent for one night or two, battle many mosquitoes to the death, and read a lot and hike a little. Or hike a lot — sometimes we walked for miles — but with no-one to scold us or tell us we couldn't, we also read. A lot. Inside our tent, we devoured newspapers, magazines, and books, all by the light of our battery-powered lanterns. Perhaps there are expert campers who would say that's nuts; we'd just say, the hikes and cookouts and scenery were nice, but reading was our favorite part of every camping adventure. There's a learning curve to camping, and we were dummies at first but got better at it. Still, even on our first camping adventure we had fun. We pitched the tent, took a long hike, then ate pork and beans from a can and roasted weenies over the fire. Then we turned in, and I snored so long and loud in our tiny tent, Stephanie finally asked me to sleep in the car so she could catch some ZZZs. That's not an unreasonable request, but I had the bright idea of sleeping in the campsite instead of in the car. I was bitten all over by ‘squeters and bugs until, in the middle of a black, moonless night, I was startled awake by something big and furry brushing against my leg. Can't say whether it was an enormous raccoon or a tiny bear, but whatever it was, I neither moved nor made a sound until it had wandered off into the darkness. And then I slept in the car, with the doors locked. For food, we packed a loaf of bread and some weenies and marshmallows for our first outing, but soon we were making hobo stew in tin foil, and frying sausages in a pan over the fire. Always the master chef, Steph was soon bringing spices and couscous and preparing fairly elaborate meals that rivaled the fine cuisine she'd create at home. We stayed at perhaps a dozen different campgrounds, all in Wisconsin, some with plumbing and some with pits, and when planning our trips I always suggested places with plumbing. Pits stink and can seem unfriendly, especially at night. Steph, though, actually preferred the pits. "We're not really roughing it," she said, "if we're using flush-toilets." On one camping trip, Steph's parents joined us for dinner, but they said their camping days were over so after eating they drove to a hotel. That was the same weekend, I think, when the mosquitoes were so numerous, so fierce, so hungry that we gave up at around midnight, packed the tent and came home. It took both of us, though, to pitch or un-pitch the tent, so when Steph started having trouble walking, the camping trips soon became a memory. The tents and sleeping bags were among the leftovers I gave to Goodwill after Stephanie's death. 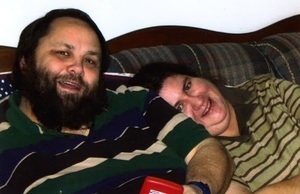 We were fat folks, no doubt about that, but before she lost her leg and her health, Stephanie loved a long walk. She always wanted to go off the beaten path, literally. It was her idea, on one hike, to climb over a stone wall and see what was on the other side. When we were at a park that had a view tower, Steph always wanted to climb it, and always beat me to the top. Many times, our hikes took us to spectacular vistas, in a meadow or a forest, or to a cliff overlooking everything on Earth. And once, her urge for adventure may have put our lives in peril. Sure felt like it at the time, but I'll let you decide. We were at Devil's Lake State Park, in Wisconsin. The trail was rather inadequately marked with signs, and it seemed a little steeper than we'd expected at first, but then it leveled out and we continued following the signs … and then the upward slope grew again, slowly enough that we thought we'd soon be on flat land, but instead we found ourselves going upper and upper, and then climbing steps carved into the hillside. It took a crazy long time, perhaps half an hour, perhaps longer, before we understood that we were climbing a mountain. We had expected an ordinary hike on a scenic trail twisting around the base of the mountain, but no, the base of the mountain was far below. The trail wasn't vertical and we weren't cliffhanging, but we were going up at quite an angle. We talked about turning back, but Stephanie wanted to reach the peak, and it seemed we were almost there, so we soldiered on. Well, we weren't as close to the peak as we'd thought. In retrospect, it might have been among the stupidest things we ever did together. When we finally reached the peak that we hadn't meant to climb, we were too exhausted to enjoy the view, and we were honestly frightened at the thought of going down the long, steep trail we'd just climbed. We'd used up all our strength and gumption. We were way, way out of our depth, or height. 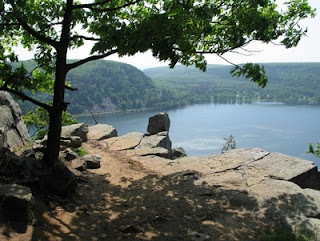 The height, by the way, is 500 feet for the East Bluff at Devil's Lake, or so says Wikipedia. That's the equivalent of a 35- or 40-story building, but without elevators. "We could wait until someone else reaches the peak, and ask them to call 9-1-1," I suggested, as Steph and I didn't have cell phones yet. "Park rangers would come and carry us down, or maybe they'd send a helicopter." Steph said no. "First off, they'd probably bill us for the expense, and anyway, with a little rest we could make our way down. I think." Worried and exhausted, we rested for half an hour, maybe longer, at the top of the bluff. Our one advantage was that we'd started early, so we still had plenty of daylight. But scariest of all, Stephanie was getting the woobles — our word for the diabetes-related dizziness and disorientation she felt when her blood sugars fell too low. We needed to get her blood sugars up, and soon. Steph had been through the woobles plenty of times, but usually she'd just drink some sugary juice, or eat a candy bar or something, and she'd feel better in a few minutes. When we were away from home, one or both of us would have a juice pack or a sweet and sugary snack in a back pocket, for just such an emergency — but on this particular day, we'd both forgotten. Like I said, we'd thought we were going for a short walk, not climbing a mountain. "Really, love," I said. "We should ask someone to call for a rescue team." "We're not doing that," she said in her stubborn voice, meaning the decision was final. Very, very slowly, we proceeded down the way we'd come up. Weak, exhausted, our footing not too stable and Steph with the woobles, we spent a great deal of time making little progress down the steep trail on the side of a mountain. We were both terrified, honestly. At the rate we were descending, it could be a long time before we reached the bottom — far longer than Steph had ever gone with the woobles making her light-headed. A couple of upbound hikers were approaching us on the narrow trail, and I said, "We could ask these people for a snack, or for help getting down." "No," Steph said. "That would be embarrassing. Please don't say anything to them." "Doug, I know you're worried. I'm worried too. But I can do this. So please, don't say anything to these people." As the other hikers came near, we nodded at them, they nodded at us, and they continued up the bluff never knowing we were scared witless. I don't know whether that was smart or stupid, but Steph was more stubborn than me, and more intelligent, so I told myself that she was right. She could do this. We continued down the trail, slowly, and whatever you're envisioning 'slowly' means, we went slower than that. We stopped several times, wherever we could find a place to lean or sit. I held her hand when it was safe to do so, but there were parts of the path where we each needed both hands free, just to keep our precarious balance. I wasn't wearing a watch, but I'd guess we spent two hours climbing the bluff, half an hour at the top, and two hours descending. When we reached the bottom, it was another five or ten minutes to the parking lot, but by this time Steph was so dizzy she was having a hard time walking, even on flat earth. We found a big rock where she could sit comfortably, and I ran ahead to the parking lot. In the back seat of our car was an ice chest with juice in it, and I brought the juice back to Steph. She guzzled it, started feeling better, but stayed sitting for a while to be safe. Then we walked to the car, still slowly but with restored stability. Our legs ached for days. I felt like a fool, and Steph said she did, too. And for as long as she had diabetes, never again did we go anywhere without snacks in a purse, pocket, or backpack.